A little about me as a breeder. I breed first and foremost for quality, soundness and exceptional temperaments. Ravensnite Kennels was only established in 2012 but I have personally been breeding and exhibiting English Cocker Spaniels since 1999 under another Prefix. During my time as a breeder, I have bred and shown many Australian Champions, Australian Grand Champions, Multi Best In Show All Breeds winners and Multi Best In Show Specialty winners. Not only are they successful in the show ring (Conformation Showing) but are renowned family pets. I concentrate mostly on breeding solid coloured Cockers ie. Blacks, Golds and Black and Tans from the best Australian lines and some of the best English lines with much success. I do on the odd occasion produce a parti coloured litter ie. Blue Roan and Orange Roans. Supreme Champion Manunga Musketeer. Aka "Raven". 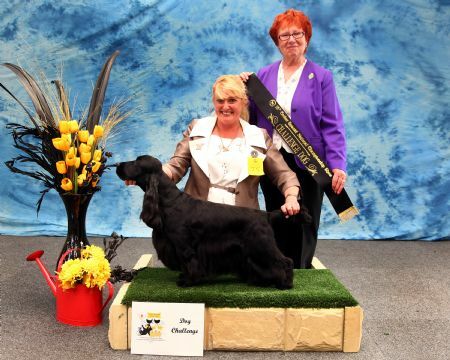 (Left) Australian Grand Champion Manunga Musketeer winning Dog Challenge at the 2012 Cocker Spaniel National hosted by the Cocker Spaniel Club of the ACT, Judge: Mrs Lorraine Palmer (Robraine Kennels) UK. A very thrilling moment for me and my beautiful boy. When this black dog came into the ring my heart skipped a beat for here at first glance was what I had sought, in whatever coloured jacket, all day. On handling he did not disappoint in any department, he is the real deal. Quality black dog of excellent type, who in my view fits the standard so closely. Classic head, darkest of correct shaped eye, clean throat, excellent front with plenty of heart room. Well off for bone, stands on tight cat like feet. Just flows through from behind his head to the root of his tail. Big ribbed and short coupled, excellent presentation, very sound on the move. He would worry the best here in the UK.